Thursday, January 12, 2017 – 7:00 p.m.
Anarcho-syndicalism (also referred to as revolutionary syndicalism) is a theory of anarchism which views revolutionary industrial unionism or syndicalism as a method for workers in capitalist society to gain control of an economy and, with that control, influence broader society. Syndicalists consider their economic theories a strategy for facilitating worker self-activity and as an alternative co-operative economic system with democratic values and production centered on meeting human needs. 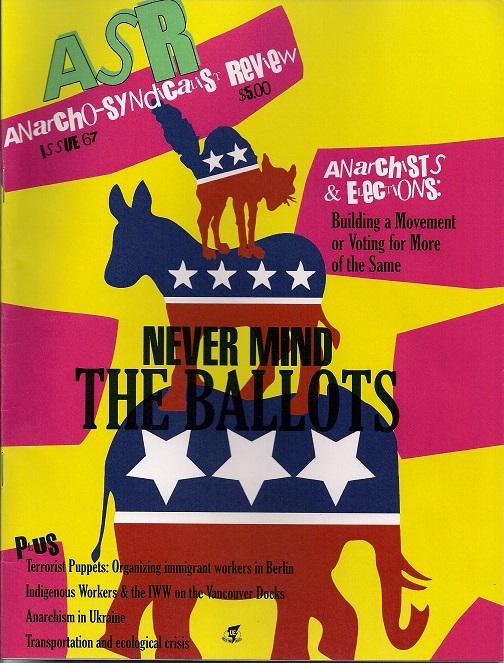 Jon Bekken is the editor of Anarcho-Syndicalist Review, an independent syndicalist magazine, published since May 1, 1986 (originally as Libertarian Labor Review). ASR is an independent forum for non-sectarian, critical, informed and constructive discussion of anarcho-syndicalist theory and practice. Note: the Democracy Center is not wheelchair accessible.